The recipe comes from Cucina Moderna magazine. It's a simple, tasty and healthy way to bring spring colours and flavours to your table. And it only takes 15 minutes to prepare it + 10 minutes for cooking. Wash and cut the vegetables. Steamcook them for 10 minutes, they should still be al dente. Prepare the seasoning. Boil an egg, let it cool, then shell and separate the white from the yolk. Blend the yolk with lemon juice, olive oil, salt and pepper. 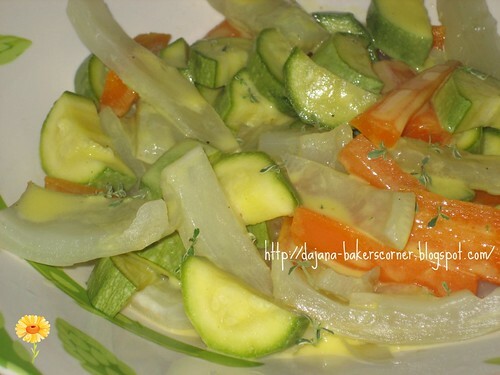 You can also add a tablespoon of capers if you like. 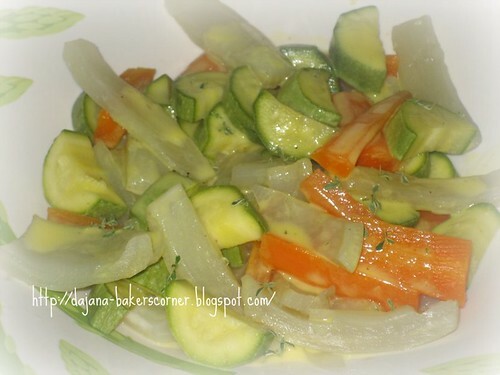 Season the vegetables, stir, sprinkle with fresh thyme leaves and serve. Here's what I served this salad with, Chicken and Zuchini Meatballs (I'll be posting about them, so come back if you're interested). Operite i narežite povrće, pa kuhajte na pari 10 minuta. Skuhano jaje očistite, pa odvojite žumanjak od bjeljanjka. Izmiksajte žumanjak s limunovim sokom i uljem, posolite i popaprite po želji, pa dodajte kuhanom povrću i lagano promiješajte. Ukrasite listićima timijana. Poslužite i uživajte. Pulite e lavate tutte le verdure e tagliatele a pezzetti. Cuocete a vapore per 10 minuti, in modo che rimangano al dente. 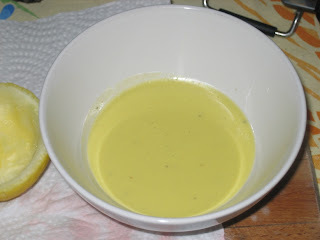 Frullate il tuorlo sodo con i capperi (io l'ho fatto senza), il succo del mezzo limone, olio, sale e pepe, fino a ottenere una salsina omogenea. Versate il condimento sulle verdure e cospargete con le foglioline di timo. Lovely! Looks nice and light. 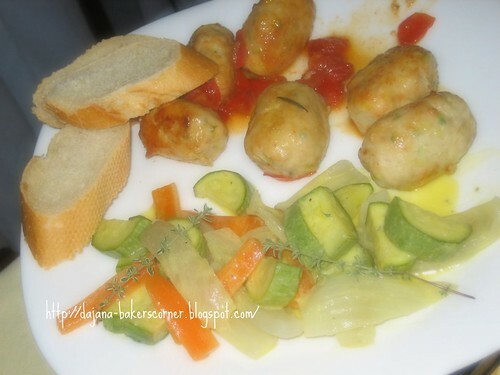 I am interested in the chicken zucchini meatballs, they look great. Very Colorful. I like it. MMMM You had me at Finocchio... Looks absolutely delicious! 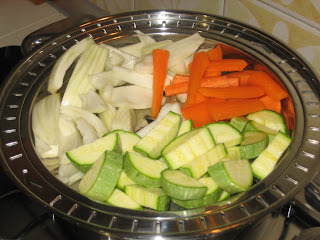 I eat steamed fish, meat, tofu, dimsum, etc, but never thought of making a steamed mixed vegetables. This for sure makes an ideal meal for a weight-loss week.